Walter Ross was a wonderful man – friendly, gentle and a real enthusiast for the sport of athletics, in particular distance running. The articles and obituaries below will testify to that in better words than I can muster but I was fortunate enough to have met him many times and hear him speak in public at dinners and prize givings. I remember him speaking at a Clydesdale Harriers Presentation when he was guest of honour in the early 1970’s and, commenting on the novel concept of ‘fun-running’ as proselytised by Brendan Foster, saying “… but when was running not fun?” I first saw him, as distinct from meeting him, when I turned up for my first ever county championships at the Brock Baths in Dumbarton. As we lined up on the Common for the start of the race, I saw this chap trotting across to the starting line with a young woman running beside him. 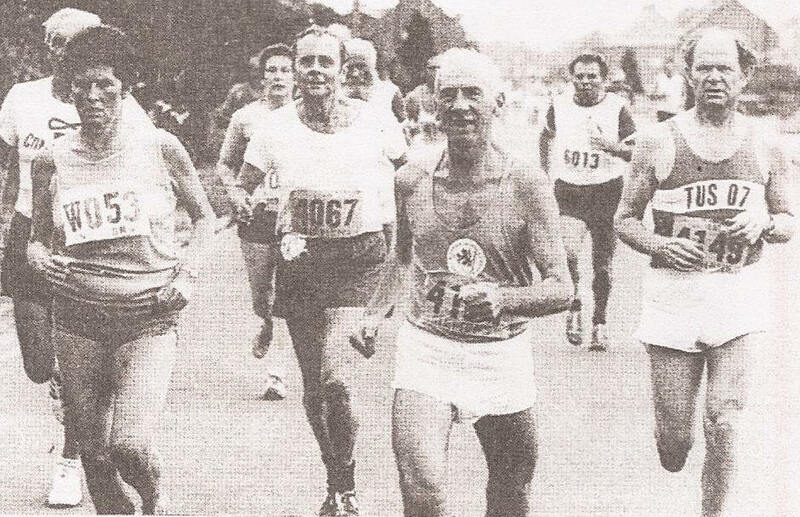 Younger than he was, and taller than he was, it was Dale Greig whose marathon career he whole heartedly supported, indeed when she went to run in the Isle of Wight Marathon, she stayed with Walter’s brother. An excellent athlete on the track, over the country and on the road, a distinguished official and capable administrator, she worked with Walter on the ‘Scots Athlete’ magazine which he founded. He also sold Hirvi running shoes from his offices in Glasgow and like many another I went up the stairs to the top floor to get these prized shoes with their spikes, which were made of copper (? ), and which didn’t last long. Athletes travelled up from England on occasion to buy their own from him. When the veteran harrier movement started up, he was the man who really provided the impetus to get the movement off the ground and keep the movement going until its impetus and sheer momentum kept it going. However, we should look at his life in athletics and I reproduce the articles from his obituary and accompanying articles in the SVHC Newsletter of August 1993. This issue of the club newsletter has to record the sad news that no one wanted to hear, the death on Friday, April 23rd, of the SVHC founder-member, benefactor and honorary president, Walter Ross. Walter was 74, and was spending some days in a Glasgow hospital for angina and other tests when an early morning heart-attack claimed his life. His death leaves a gap that his family, friends, colleagues and fellow runners will find impossible to fill. The reminiscences and tributes in this newsletter are only one small indication of the affection Walter was held in, wherever he travelled. Then there was a double page spread of ‘Marvellous Memories’ under the comment: On these two pages are some of the memories left to his friends by Walter Ross the runner. But Walter, of course, was a man of many other parts. A brother to Norman, Bill, Henry and Isabel. A devoted 24-hours-a-day husband to Winnie, who’s now living in a residential home. A printer and publisher unlike any other business man, whose qualities were so ideally complimented by partner Dale Greig. Walter was once a footballer, later a ballroom dancing enthusiast. Once a Sunday School teacher, later a humanist and always an optimist, this was the man who one day in 1970 had the ‘marvellous’ idea of forming the SVHC . . .
First, SVHC President Danny Wilmoth’s tribute to Walter. 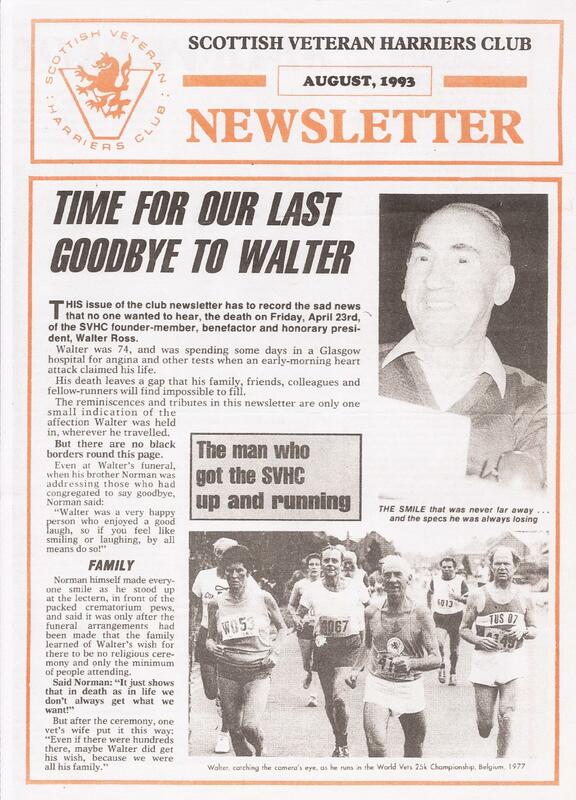 “Walter Ross – what a sad loss this man will be to Scottish Veteran Harriers. His generosity in providing printing services, including this magazine, prizes at races and gifts to the Ladies at Christmas will be greatly missed. Walter was very enthusiastic about Veteran Athletics and he spread his infectious enthusiasm and love of the sport throughout many countries worldwide, as he travelled to further the Veterans movement. He was a member of IGAL and set up world and European Championships in many countries. Walter’s other hobby was ballroom dancing and with his wife, Winnie, would give excellent demonstrations at many of the Veterans social functions. Walter printed ‘The Scots Athlete’ magazine in 1946 – before any other magazine in Scottish athletics was thought about. A man before his time, indeed. Walter was never one to complain, although towards the end of his life, he was suffering. He still managed to travel to Birmingham to see the SVHC vest represented amongst the world’s Veteran movement. I personally will miss our chats in his office on a Friday morning. Often we would be discussing a problem and with his usual smile, Walter would say, “Don’t worry, it will work out all right on the day, don’t worry.” The Sc ottish Veteran Harriers will never forget Walter Ross. We are all indebted to Walter, both as a founder member of our club and for his loyalty, support and friendship over many years. Next year we plan to have a Memorial race and we are sure that club members will turn out to give something back to the man who started it all – Walter Ross. Now for the memories. First, Jack MacLean tells how it all began, then Dale Greig talks about his enthusiasm and Emmet Farrell just talks about his friend. I can see Walter yet, with his usual happy beaming expression, the day he voiced the idea of forming the “Scottish Vets Club.” It was a winter’s day at Stirling Univresity after the Midland District Cross-Country, and I was covered in glaur, heading for the shower. Walter asked if I’d be on the first committee – and organise the first race. With the help of Davie Corbett, it was staged in Pollok estate, Glasgow. Five miles cross-country. And if memory serves me right there were 30 starters. Small beginnings for a club of about 1000 today. It’s often been said that someone would give you the shirt off his back. But in Walter’s case it wasn’t just a saying. At the world championships in 1973, one unfortunate West German in an older age-group had been overlooked in the prize-list. Walter quickly removed his own ‘new’ pullover – with the creases still in – got paper from goodness-knows-where, and made up a parcel. And it was presented to the runner hot from Walter’s back! Walter Ross, you will be sorely missed. For the first time in years I know my telephone will not ring late tonight, previously a frequent feature of my evenings, for although I saw Walter at work every day, there would often be a late night call, an encore, an epilogue to the day’s activities; some business to discuss or just some piece of news or ‘tittle-tattle’ to impart. The silent bell, as the day ends, speaks volumes. More than anything it brings home to me the realisation that Walter J Ross, my long-time friend and colleague is gone, and that his voice will be heard no more. Yet whilst mourning his death, those of us who knew him well will not lose sight of the important thing – that he did live, a life of struggle in many ways, but a life full of meaning. He has left all who know him and associated with him the memory of a true friend for whom service was more important than success and the joy and purpose of life. He was just 27 years old when he first published ‘The Scots Athlete’, regarded now as a great historical reference for the sport. Just as that publication was the articulation of the young man’s vision, so the founding of the SVHC in 1970 shows he still had the same vision and vigour when he had passed his 50th birthday. He had stayed the distance. Walter was one of those mortals who never grows old. He retained that youthful enthusiasm, competitive spirit and robustness of purpose that was an inspiration to us all. His running activities took him all over the world, and when he wasn’;t competing in races he was ‘running’ them (! ), the most notable being the World IGAL championships (10K and Marathon) which he brought to Glasgow in 1980. “Nothing great was ever achieved without enthusiasm” (Emmerson) was a bye-line that ‘The Scots Athlete’ carried for many years, Walter was enthusiasm personified in everything he tackled. He was a great champion too of women’s struggle for advancement, particularly in sport. When I helped found the Women’s Cross-Country Union in 1960, this too was Walter in the background with another of his ‘marvellous’ ideas! I did not expect his life to end in the way it did. Unfortunately death is no respecter of persons or age. As Omar says: ‘The moving fin ger writes, and having writ, moves on’. It is, knowing him, a happy thought that his courage, determination and mental vigour remained undiminished to the end. I last saw him some 36 hours before he died, when, ever the optimist, he asked me to make travel arrangements so that he could have a holiday when released from hospital! An so, at last, farewell, dear friend. But not to forget .. only a kind of chastened au revoir. In spirit you are with us always! Having known Walter for over 50 years – even before I met my wife, Jean – it is no0 wonder that his passing has left me devastated. Walter showed his pioneering qualities by launching in 1946 the ‘Scots Athlete’ to which I made a monthly contribution under Running Commentary. The magazine was well-received and travelled to many countries. However it was non-profit-making, and Walter’s principles wouldn’t allow him to take adverts for drink or tobacco. Sadly, it finally closed. Gentle and endearing, Walter had the highest of ethical standards, especially if injustice was involved, or man’s inhumanity to man. His optimism was remarkable despite the stress of business and later, domestic duties. And starting up the Scots veteran athletic movement was an act of real citizenship. Walter admired the talented elite, but wanted sport to be for all. I’m sure many new adherents joining us for competitive or constitutional reasons do not know that this quiet, modest little chap was the cause of their new-found opportunity to enhance the quality of their lives. From the approximate 12 apostles, the movement has now grown almost a hundred-fold. Robert Louis Stevenson said: “To miss the joy is to miss all.” Walter would have endorsed that. In almost all strata, today’s world is very professionally-oriented or, to put it bluntly, MONEY-MAD!” But Walter, on the other hand was the supreme amateur. The multitude of veterans who run on country roads or woodland paths and grassy verges, rejoicing in the colour and poetry and space of the great outdoors, provide a living and vital memorial to a person for whom there is only one epithet. Unique. Some years ago, I was working with a dance director who told me he’d taught Marilyn Monroe the steps for one of her films. Then in the very next breath he said: “You do a bit of running, don’t you? Do you know Walter Ross?” And it soon became obvious that Walter was held in the same high regard in the dance world as he was in the running world. It shouldn’t have been surprising, really. I once went into Walter’s office only to be told by Dale that he’d slipped out for a moment and she didn’t know exactly when he would be back. I’m glad I didn’t wait. For he’d decided to ‘slip out’ to Blackpool for the ballroom championships! A great sayingof Walter’s was “That’s marvellous.” Whether he was talking about some run you’d had, or some work you were doing, he made you feel ten feet tall. His bag was always big enough to produce just one more prize, especially at the Glasgow 800. And I for one will be so glad if we can keep this race going as a memorial to Walter and his generosity. As I write these few words, I have in front of me a photo of Willie Russell and myself standing on the road after we’d done our stint in the Alloa relay. Walter took the photo and gave it to us saying it would bring back happy memories to two old friends. True, but I won’t need any photos to bring back memories of Walter. They are all in my heart. It seems only a few years ago that with Walter’s driving force the SVHC came into being. His philosophy, always, was to run hard but above all to have fun. And as we ran here and there in pursuit of fitness and well-being, some people looked on us as a bunch of cranks who had seen better days. Be that as it may, what enjoyable times they were. These beginnings will always remind me of Walter, and of his band of merry helpers such as Norman, George Pickering, Dale Greig and many others. I think too of the many occasions when Walter’s thoughtfulness and generosity saved the day for others. At one world vets championship, on Isle of Man, when the organisers couldn’t afford to give trophies to the leading runners, Walter did one of his disappearing acts and returned with a bag of all sorts of prizes. On another occasion, in Berlin, only the winners in each ten year age group received a prize. Again he came up trumps – and presented medals to the other leading runners. These acts of magic would put even Bill McBrinn’s professional performances in the shade. On the social side it was a delight to see Walter’s talent as a dancer when he and Winnie took to the floor. I’ll always cherish the friendships Betty andI made at the get-togethers the Ross families used to organise. Although Walter was modest and compassionate, as a man of substance he wasn’t afraid to speak his mind on controversial matters even if others were silent. He wasn’t a taker, he was a giver. And I wonder if he really received the recognition he deserved. Sadly I mention this with a tear in my eyes, as perhaps some of us should have taken the initiative. Walter of course would have preferred others to have been given the honours. Well we do have other great characters of that generation in our ranks. Don’t let us be too late to honour them. I personally owe Walter so much for his kindness and encouragement over the years, and only wish that I had embarrassed him more by telling him so – I hope he knows how I feel. Unfortunately, there is not a lot of information on Walter, either in print or on the internet. We know that he joined Garscube Harriers in the 1930’s and was a keen runner although not a speedy one. He never made the scoring six in the National Cross-Country Championship or the Edinburgh to Glasgow team but he was always there for the inter-club events. David Fairweather points out that Walter ran in the Ben Nevis race in 1970 finishing in a time of2:21:52. He ran mainly in road races but we know that he won the Scottish Over 50’s championship in 1973 (7 seconds in front of Gordon Porteous) having finished third the year before. Then in 1979 he won the M60 bronze behind his friend Emmet Farrell and James Youngson of Aberdeen.